Indonesia Supports Palestinian Independence - What About West Papua? Earlier this year, the Organization of Islamic Cooperation (OIC) held its extraordinary summit in Jakarta with the theme "Independence is the right of all nations". The Government of the Republic of Indonesia reaffirmed its support for the independence and sovereignty of Palestine. In fact, through a bilateral meeting with President Mahmoud Abbas, Indonesia stated it had already opened an Honorary Consulate of Indonesia in Ramallah. The commitment of the Indonesian Government to support Palestine is in full accordance with its own Constitution of 1945 which stipulates that all colonialism must be abolished in this world. At the same time, the Indonesian Government is hiding from the West Papuan political conflict, which involves a territory which was taken over forcefully in 1962, annexed illegally in 1969 and which has been occupied and subjugated up until today through militaristic and colonialist practices, causing acute humanitarian crises, devastation to the environment, considerable appropriation of natural resources, as well as the massive migration of Indonesians to West Papua. Since 1961, the Papuan people have pledged to stand alone as a nation and as a State. And since then, the people of West Papua have waged a struggle filled with sacrifices in their quest for independence and sovereignty for nearly half a century, with no amicable solution between West Papua and Indonesia in sight. If the Indonesian Government is committed to help achieving the independence and the sovereignty of Palestine, the question is what about West Papua, which lost its right to independence and sovereignty? We, as organizations which have come together under the umbrella of the national struggle of the people of West Papua, that is the United Liberation Movement for West Papua (ULWMP), which is also a member observer in the sub-regional organization known as the Melanesian Spearhead Group (MSG), are of the opinion that in reality, if one is passionate about liberating Palestine from Israeli occupation, one should also be passionate about decolonizing West Papua. How can Indonesia supports Palestine's independence and sovereignty, while the Papuan People are still colonized by Indonesia? How can Indonesia actively be involved in the peaceful settlement of the Palestine question at the UN, while it is rejecting any form of peaceful settlement of the political status of West Papua? If Indonesia joins the efforts of the OIC to support Palestinian independence, Indonesia should also, as an associate Member of the MSG, promote the right to self-determination of the People of West Papua, in accordance with the 2013 MSG final communiqué. If Indonesia is also pushing the OIC for various fact-finding teams in Palestine, why does Indonesia, as a "dialogue partner" of the Pacific Islands Forum (PIF), not want to open access to West Papua for the fact-finding team from South Pacific nations, as agreed in the communiqué at the Forum's last Leaders' Meeting in Port Moresby, in September 2015? And what more, why does the Indonesian Government persist in rejecting the call of H.E. Mr. Manasseh Sogavare, Chairman of the MSG, for a dialogue with the ULMWP. We support the OIC's efforts for a peaceful settlement of the political conflict between Palestine and Israel. We are hopeful that the Government of President Joko Widodo will join to seek a peaceful solution to the independence and sovereignty of the nation of West Papua. We also sincerely hope that member countries of the OIC will actively urge Indonesia to stop their illegal occupation of West Papua, and, together with the ULMWP, to resolve the political status of West Papua peacefully. 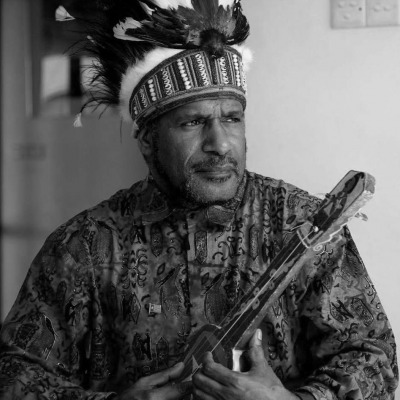 Benny Wenda is an exiled West Papua independence leader living in the UK. He is the International Spokesman for United Liberation Movement for West Papua (ULMWP) and founder of the Free West Papua Campaign. Benny Wenda is West Papua's independence leader, International Spokesman for the United Liberation Movement for West Papua (ULMWP) and founder of the Free West Papua Campaign. He lives in exile in the UK.